The commission has initiated numerous cases of extra-judicial killings in Manipur – the start of an invaluable consolidation of the rule of law in the state. The Supreme Court’s judgement of July 8, 2016 on the use of the Armed Forces (Special Powers) Act, or AFSPA, in Manipur, which reiterates that that Act cannot justify the use of excessive force and rejects the claim that soldiers acting under its cover can only be tried in military courts, is not only very welcome in its own right but also a partial redemption for a court which gave the Act its benison in 1997, even though this judgement bows repeatedly to that. The court had before it a sample of 62 cases of ‘encounter deaths’. It noted that the NHRC had held that 31 were fake, had not yet reached a verdict on 17 and had not received any complaints on 7. It had closed 7 out of the 62 and, reading ‘some’ of these orders, the court held that the commission had not applied its mind to these cases. But what of the 31 that the NHRC held to be extra-judicial killings or of those where its proceedings are still under way? It seems the affidavits filed by the NHRC were not helpful. In its judgement, the court says it found at least one of them vague. That is unfortunate, because clear, precise affidavits would have explained to the court the painstaking process through which the NHRC had held that at least 31 of the 55 cases it had considered were fake encounters. From November 2009, the NHRC decided that all encounter cases would be referred for final decisions to two two-member benches. I was paired with a remarkable crusading judge, B.C. Patel, formerly chief justice of the Delhi high court, who took the view that no institution was above the law, no law could grant absolute immunity to public servants and impunity from justice was unconstitutional. Our bench, therefore, did not consider the AFSPA any defence at all for a soldier or unit charged with a violation of human rights. We made it clear repeatedly in the proceedings of our bench that the antecedents of the victims were not germane to the commission’s examination of the circumstances in which they were killed. We believed that in a democracy, even terrorists who rejected and violently broke the rule of law were entitled to its protection and could be killed only in self-defence or, if captured, through a fair trial that led to a sentence of death. In our view, if a democracy condoned or justified extra-judicial killings because the victims were, or were suspected to be, terrorists, it was defending itself through the means used by those who wanted to destroy it. That would be a logical response from a totalitarian state, but absurd, morally degrading and self-defeating for a democracy. Since we brushed the AFSPA aside, the government invoked article 19 of the Protection of Human Rights Act (PHRA), a blot on the law that circumscribes the commission’s powers vis-à-vis the armed forces. It has full powers to investigate any complaint against all other public servants, but can only ask the central government for a report on a complaint against the armed forces and make a recommendation thereafter. Before 2009, it was NHRC practice to go by the letter of the law: since the government usually reported that the forces had violated no rights, the commission closed its files thereafter. If these were the closed cases sent to the Supreme Court, it is right to criticise the commission for not applying its mind. That, however, was emphatically not the practice of our bench. We held that the law did not specify that the NHRC would have to accept whatever the government sent. Its report had to provide the material on which the commission could come to a decision to close the case or to make a recommendation. We would therefore list the questions the first report did not answer and set time-frames within which we expected a comprehensive reply. It always took a long time to get responses, but we invoked the commission’s power of summons whenever necessary to prod the Ministry of Defence. We did not, however, limit ourselves to reports only from the armed forces. 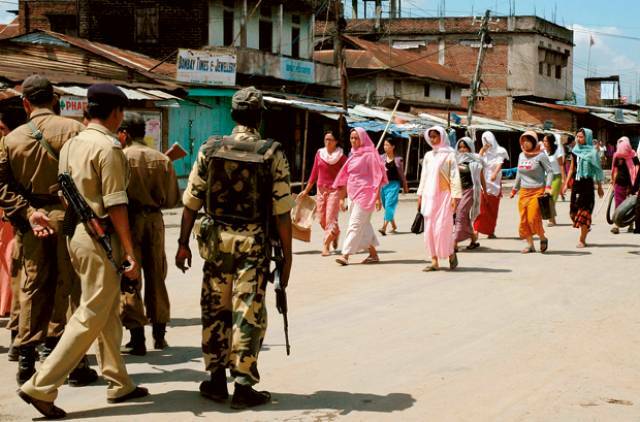 To maintain the fiction under the AFSPA that the army in Manipur acts in aid of civil authority, it always carries out ‘joint operations’ with the police. At best, a policeman would tag along with the soldiers; often, we were told, there would be none, but the report to the NHRC would formally claim that this had been an operation with the police. Since the NHRC has full powers over the police, we insisted that the Manipur government give us the same reports, conduct the same enquiries and bear the same responsibilities that its counterparts elsewhere did after deaths in police encounters in their jurisdictions. The state government protested that its policemen were at most a token presence in army operations, but could not, without contradicting the army and destroying its credibility, deny that they were there. It therefore complied sullenly with the commission’s orders, had enquiries conducted, sometimes repeatedly when we were not satisfied with the quality of the first, sent us the reports we needed or confirmed that essential investigations had not been conducted at the time. The Manipur government’s reports, analysed with those of the army, led us to conclude in a series of cases that these were extra-judicial killings. There were recurring scenarios for these operations – terrorists had approached a check-point and been killed when they opened fire or had been holed up in a house in a village or a hut in a rice-field, from where they had engaged with the soldiers. In those cases where awards of gallantry had followed, the unit had often claimed that it came under fire from a hill, which it had charged, killing some of its adversaries and routing the others. For utterly mysterious reasons, doctors in Manipur conducted post-mortems conscientiously and reported on them in the format laid down by the NHRC. (In most states, autopsies are carried out by the men who handle the dead bodies, not by the doctors, and the reports, like the forensic process, are a travesty.) Our bench found these superb autopsy reports usually demolished the army’s claims. They sometimes showed deep contusions that were ante-mortem, an indication that the men had been beaten before they died, the entry wounds were sometimes either tattooed, blackened or burnt, forensic evidence that the shots had been fired from a few feet away and the exit wounds were often well below the entry wounds, the bullets having travelled sharply downwards through the body, proof that the shots had been fired from directly above the victim: these were the hallmarks of executions in which the victims had been tortured, made to kneel and shot. The army had not reported hand-to-hand combat, in which entry wounds would certainly be tattooed or blackened; it was always firing at a distance. And in those cases in which the soldiers claimed they had charged uphill, the exit wounds on the men they had killed would have been higher than the entry wounds. The defence ministry could not explain away these reports. The army claimed its men were innocent, particularly if a court of inquiry had exonerated them. As the army’s inquiries looked into none of the crucial questions we raised and were usually as superficial as the injuries soldiers sometimes reported after these operations to give them verisimilitude, we rejected this argument. The magisterial enquiries were often perfunctory, but inquests had usually been carried out after the deaths. The thana diary had also recorded what the police were given by the army after the operation and what they recovered when they went to the scene. These too were revealing. Sometimes, even after an operation in which men had been killed in huts from where they had allegedly fired on the force, no spent cartridges were recovered. There was no evidence of bullet-holes, either on the hut or on those facing it, where the soldiers would have taken cover. And none of the standard forensic tests had been carried out, either on the victims or on the weapons they had allegedly used. No attempt had been made to lift fingerprints from a weapon and match them against a victim’s to establish that he had held it, to take swabs from his hand and test for gunshot residue to prove that he had fired a gun or to subject the gun and any spent cartridges found to tests in a forensic laboratory to confirm that it was in working order, had been fired and the cartridges had been fired from it. In the absence of this evidence, we held there was no proof that the victims had either possessed or used the weapons found after their deaths near their bodies. Where we held the encounters were false, which was more often than not, we recommended relief for the families, which the central government usually paid, even if reluctantly and late.